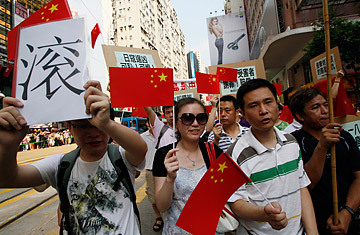 Anti-Japan protesters hold banner written "Get out" during a march in Hong Kong on Saturday, Sept. 18, 2010. Ever-present anti-Japanese sentiment in China has been inflamed in recent weeks by Japan's arrest of a Chinese captain after his fishing boat collided with two Japanese coast guard vessels in waters near an island group claimed by both Tokyo and Beijing. As tensions between China and Japan continue to escalate, both sides can take solace knowing that things could be much worse. And not long ago, they were. In 2005, large demonstrations broke out in Beijing, Shanghai and Guangzhou and other Chinese cities in response to Japanese efforts to win a permanent seat on the U.N. Security Council and a Japanese history textbook that downplayed its wartime aggression. Protesters smashed windows of Japanese restaurants and other businesses, and police struggled to control thousands of demonstrators who surrounded the country's embassy in Beijing, some hurling rocks and bottles over the compound's gates. On Saturday Chinese demonstrators gathered at the Japanese Embassy once again. The date was the 79th anniversary of the Mukden incident, a plot by Japanese Imperial Army officers that helped provoke the Japanese invasion of Manchuria. This time the antagonism was over unoccupied islets in the East China Sea known as the Diaoyu in Chinese and the Senkaku in Japanese. Japan has administered them since the early 1970s, when the U.S. ended its post  World War II control. But China and Taiwan also lay claim to them, and the likelihood of oil and gas reserves in the surrounding seabed has raised the stakes of the dispute. On Sept. 7, Japan detained a Chinese skipper after a collision between his fishing boat and two Japanese coast guard vessels happened near the islands. While Japanese authorities released the boat's 14 Chinese crew members, captain Zhan Qixiong is still being held while he is investigated for "obstructing officers on duty." Zhan, 41, could face three years in prison. The Sept. 18 protest in Beijing was small and tightly managed by police, who outnumbered the 100 or so demonstrators by several times. The authorities allowed small groups of five or six to pass through police lines surrounding the Japanese Embassy and march to the front gate, where they chanted demands that Zhan be released. "Japanese invaders roll out of the Diaoyu," read one sign. "Wake up the Chinese people," said another, written on a rubber bath mat. "Our territory has been taken by the Japanese and our ship has been rammed. They've arrested the captain and want him to say the Diaoyu are part of Japan," said one demonstrator, a 25-year-old student who declined to give his name. "We shouldn't come here? Every Chinese should come." The authorities had, indeed, made efforts to limit the turnout. Many posts on domestic blogs and message boards that discussed the demonstration were taken down. Since the Sept. 7 incident there has been a heavy police presence outside the embassy. And during the weekend's demonstration, officers would tell people to move along any time more than a couple dozen people gathered in one spot. Their fear was not just that the protesters could get out of hand, as they did in 2005, but that they could find other targets for their anger. Anti-Japanese protests in China have a long history of turning against the government, going back to the start of the May 4th Movement in 1919, when student demonstrations against handing over German concessions to Japan in Shandong province also focused on China's weak response to imperial powers. On Saturday, the numbers of police outside the Japanese Embassy were matched by those protecting the Chinese Foreign Ministry building one mile to the north. A group of protesters broke away and began to march toward the Foreign Ministry, but were met by police who took their signs and forced them to disperse. "Forget about it!" several officers shouted at the demonstrators. In reality, it's been the Chinese government that has largely monopolized the expressions of anger at the latest Diaoyu incident. Uichiro Niwa, the Japanese ambassador to China, has been summoned five times by Chinese officials demanding the captain's release. On Tuesday, Chinese Premier Wen Jiabao told a group of overseas Chinese in New York City that the Diaoyu are China's "sacred territory" and Zhan's detention is "illegal, unreasonable and has caused grave harm to the captain and his family," according to a statement posted on the Foreign Ministry's website. "If the Japanese side continues to cling to its stubborn course, the Chinese side will take action, and the serious consequences will be borne by the Japanese side," Wen said. China has suspended high-level contacts with the Japanese government, and talks on resolving competing claims to gas deposits in the East China Sea were also postponed. Japan's Chief Cabinet Secretary Yoshito Sengoku called for calm on both sides Tuesday. "We should be careful not to stir up narrow-minded, extreme nationalism," he said. The next day, he suggested high-level talks between the two sides to resolve the dispute. While the public anger directed at Japan is more restrained than in 2005, patching up diplomatic relations yet again might not be as easy as before. Japan and China have enjoyed relatively stable ties in recent years. In 2006, Junichiro Koizumi was the last Japanese prime minister to visit the Yasukuni Shrine, controversial in China because some war criminals are among the soldiers enshrined there. But this year, China surpassed Japan to become the world's second largest economy, and Japanese leaders are concerned that China's policy of maintaining a weak currency is hurting Japanese exports. The growing tension over economic issues may make compromise in other areas difficult. And the nature of the current dispute is different from the 2005 discord, says Andrew L. Oros, associate professor of political science and international studies at Washington College in Chestertown, Maryland. "This crisis is about territory, something China is very sensitive about, and Japan is holding a Chinese citizen. The latter issue could, in principle, be resolved if the captain were released... But the former issue cannot easily be resolved since both countries have firm positions on their sovereignty," Oros says. "I think this issue is more serious and more difficult."